Ben Foster has simply never gotten his due as one of if not the finest actor of his generation. Leave No Trace, I fear, will not get him his long-overdue Oscar recognition. However, Leave No Trace is not just his finest performance yet in a catalog of fine performances but a smashing debut for his young costar and one of if not the best feature film I have seen this year. For some time, Will (Foster) and his teen daughter Tom (Thomasin Harcourt McKenzie) have been living 'off the grid' in an Oregon state park. They live off the land and seem content with life up in the woods, going into town only to gather what supplies they need and to get Will's VA medication, which he quickly sells to other squatters. One day, however, someone spots Tom, who is not sure if this stranger did spot her or not. They were, however, and the authorities quickly nab them. The authorities are well-meaning, attempting to accommodate their desire to be as isolated as possible while still being within civilization. They get Will a job and Tom to start going to school. Will does not so much struggle with society as he finds difficulty in not living as he wishes, his private demons still pursuing him. For her part, Tom accepts all things and appears to like her new surroundings. She is drawn to a young man, Isaiah (Isaiah Stone), his rabbit and the 4-H Club he belongs to. Will, however, finds this life is not what he wants or wants for his daughter. One day, he tells her to take what she needs and nothing else. He's decided to return to the woods, and she reluctantly goes. From there, they go on the lam, but this time Tom begins to question openly Will's decisions and views. She loves her father but also becomes less willing to live as he wishes. Nevertheless, she goes with him on this odyssey, eventually ending in a secluded cabin in Washington State. Tom is alarmed when Will does not return and finds him injured. She comes across a group of mountain bikers who take Will to an RV community that somewhat reluctantly agrees to shelter them. Will still finds no real peace and wills himself to recovery. Tom sees this community and is similarly drawn to it. When Will decides they are ready to leave, Tom finally states she does not want to. Nevertheless, she does start the journey, until at one point, she stops. It is now that Will sees that Tom does not suffer from the private agony he has. They part, with him going into the woods and her going back to the community. Leave No Trace is a deeply quiet film, but that quiet is immensely powerful and moving. Anne Rosellini and director Debra Granik's adaptation of Peter Rock's My Abandonment is very sparse, but it's that very sparse nature that leaves the greatest impact. Nothing is spelled out, nothing is overt. There are no great dramatic moments: the loudest anyone gets is when in two separate scenes Will and Tom shout for each other. Instead, Granik has these moments that give us information and detail with symbolism without them seeming out of context. Of particular note is when near the end, one of the RV community figures invites Tom to look at the beehive she tends. Later, Tom has Will look in on the bees. As Tom calmly gathers the bees to her surprisingly calm father, she says, "See? You don't need to be scared". The context is on the surface with regards to the bees. The subtext is with regards to living with others, to Will's struggles of living within the community. Leave No Trace is also brilliant in the performances. Ben Foster has never gotten the credit he deserves and seems to never find that truly 'breakout' role that would put him on more people's radar. Despite an array of strong performances in Hell or High Water and Ain't Them Bodies Saints among others, Foster just can't seem to get the notice his talent merits. Perhaps his failed star-launch in the disastrous X-Men: The Last Stand still haunts him, yet I digress. In Leave No Trace, Foster gives not just an astounding performance but a totally moving one. His Will is not insane or evil, but loving towards his daughter. In that loving though, there is a strange sense of possessiveness. His motives are always for what he sees and thinks is best, but I don't think he once asked Tom what her views were. Even that was not driven by ego but by his blind devotion to his own sense of protection. There is a quiet yet troubled stoicism in Foster's Will, someone we can see knows the world but is still haunted by it. He is matched by McKenzie in what has to be one of the best performances this year. Her Tom is gentle without being naive, again aware of the world but devoted to her father. 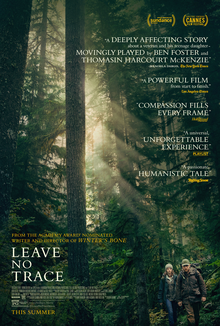 In many ways, Leave No Trace is about Tom finding her own identity, her struggle to remain loyal to her father while also discovering the world that Will has pushed away but that she at least is willing to explore. McKenzie's Tom is not an innocent who knows nothing. She instead is a young woman who accepts things as they are until she has a taste of 'the world' and the goodness of people. Her openness, her lack of hostility and interest in things beyond the forest make her evolution from unquestioning to openly if respectfully defiant a fascinating journey to see. Leave No Trace is what films should be: moving without being maudlin, intelligent without being inaccessible, well-acted without being showy. Ben Foster just keeps slamming acting home-runs, Thomasin Harcourt McKenzie is an extraordinary find who should be given more roles. Incredibly directed and filmed, with no overt villains but flawed people doing what they think is right, this film is one I can't recommend enough.